Cracking can be caused by aging, low temperature effects, fatigue, or movements in the base caused by shrinkage or existing cracks below the pavement surface. 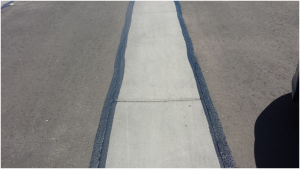 In many situations, the best way to seal the surface again is crack sealing with an elastomeric asphalt compound. Generally cracks that are 7-15mm are candidates for crack sealing. Fatigue cracks are usually an intense pattern and more suited to overall treatments like asphalt rubber chip seals or Cape Seals. Crack Sealing is used as a preparation treatment before another type of surfacing, for example, seal coating, slurry seal, microsurfacing or hot mix overlay. Crack sealant may be cold or hot pour. Cold crack sealant is emulsion-based and usually latex modified. Hot pour crack sealers are generally crumb rubber or SBS modified at high concentrations (25% and 12% respectively). These materials are highly elastomeric and stretch and recover with the movement of the crack. 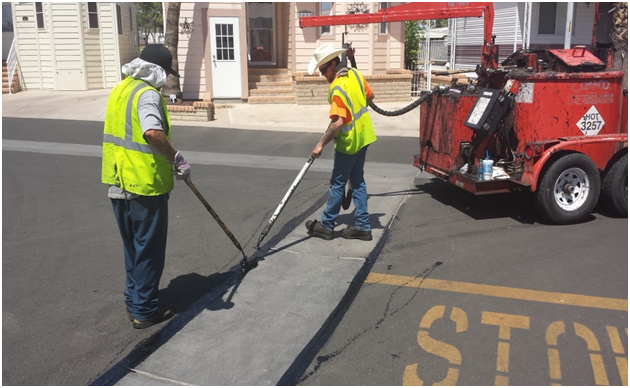 Southwest Slurry Seal, Inc. uses hot pour rubberized asphalt or elastically modified asphalt sealant. The cracks are cleaned with compressed air or, if required, vacuumed to eliminate PM-10 emissions. Crack sealer is poured or injected into the crack with an applicator wand. The surface is finished with a shoe leveler or similar device on the spray wand. Crack sealing prevents water from getting into the pavement. 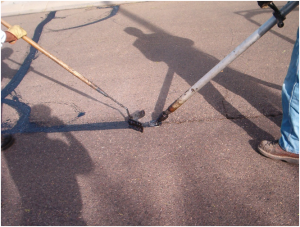 Applied at the right time, crack sealing will prevent or delay pothole formation. It should ideally be used with some sort of final overlay. Because cracks are a function of stress relaxation in the pavement, i.e,. they can open up in places other than the filled areas.